Il bel far niente, is the Italian concept of sweet idleness, or the beauty of doing nothing, a phrase which I first discovered, possibly like many of you, during my first reading of Elizabeth Gilbert’s Eat, Pray, Love. “The beauty of doing nothing…has always been a cherished Italian ideal. The beauty of doing nothing is the goal of all your work, the final accomplishment for which you are most highly congratulated. The more exquisitely and delightfully you can do nothing, the higher your life’s achievement,” Gilbert writes. I love this concept, mostly because it’s so elusive to me. This photo, which I took in Lecce last September, captures this Italian concept to me. 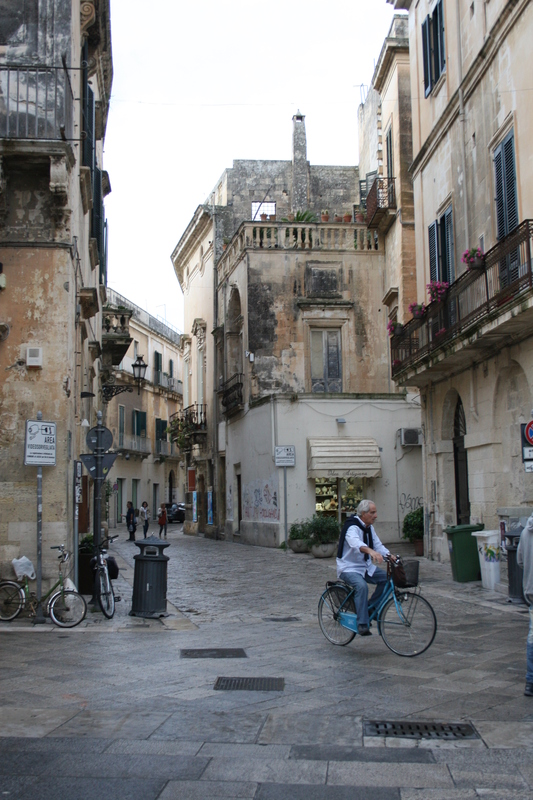 Perhaps this man is just having a leisurely ride through these beautifully paved streets of Lecce. Forse, maybe, he is on his way home from, or to, work. He could be meeting a loved one for an apertivo. Whatever it is, something about it strikes me as elegant, majestic and peaceful in its simplicity. Tags: Capturing Italy. Bookmark the permalink.